It was as if we’re inside an oven. Our supposedly AC van from General Santos City to the town of Glan in Sarangani wasn’t an easy ride at all. Me and my buddy were at the last row of this almost dilapidated van with our huge backpacks on our laps. I couldn’t move nor feel the AC, everyone felt the same. We opened the windows to let some air in but the intense heat of Sarangani was killing me. And then engine trouble. I was about to throw my biggest tantrum of the year when I noticed how everyone was just giggling about the situation as some of the passengers pushed the van to kick start it. And I realized how could I complain when they were all so cool about it. 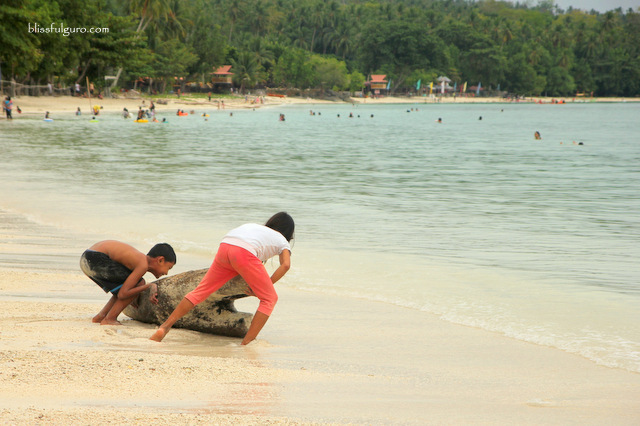 We’re on the last leg of our SOCCSKSARGEN trip and after exploring a bit of General Santos City and were fed with Tilapia almost every meal at Lake Sebu and Lake Seloton, we embarked on a beach trip in Glan, Sarangani; Gumasa Beach as our main target. Arriving at the van terminal near KCC Mall, we looked for the van that would bring us to Glan. There was a huge sign that confirmed our destination. The van was almost filled up so we squeezed ourselves on the last row. We paid P100 each for the 1-hour ride. We endured the 1-hour ride with a non-existent AC from the van. I felt so duped at that time. But looking at the happy and relaxed demeanor of the passengers, I couldn’t complain. We arrived at Glan Terminal and were immediately greeted by ten or so tricycle drivers asking us on our destination. We shyly passed by them and went on a store to buy some soda. 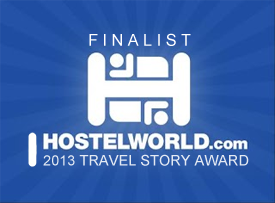 From there, we checked our beachfront accommodation options online (great researchers, I know). 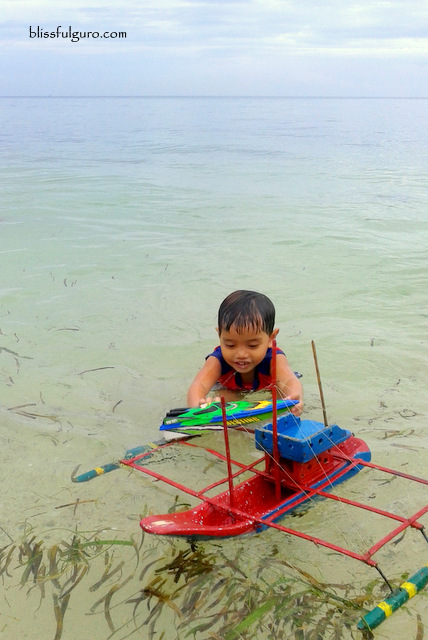 After confirming that a specific beach resort had vacancy, we hired a tricycle that would bring us there. We paid P25 each for the ride (P40 each for farther resorts). 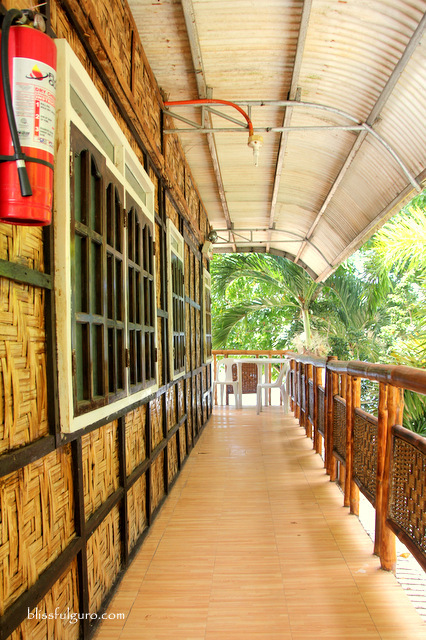 We arrived at Brod Louie Resort where a lovely lady, the receptionist, greeted us and immediately showed us our room. 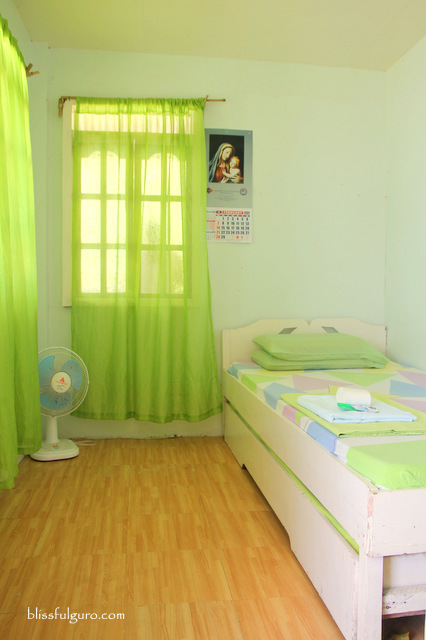 Our 600-peso room (which was totally a bargain on that area) had a bed and fan; very basic. But what I loved about it was that our room was on the second level, the farthest end, which was a meter away from the resort’s balcony. We had a great view of the beach which what we really wanted. It was high noon and we decided to have some lunch (we did some grocery shopping from town) of instant noodles and canned tuna with the help of the staff at the resort (they provided free drinking/hot water and they let us cook on their kitchen for a fee). 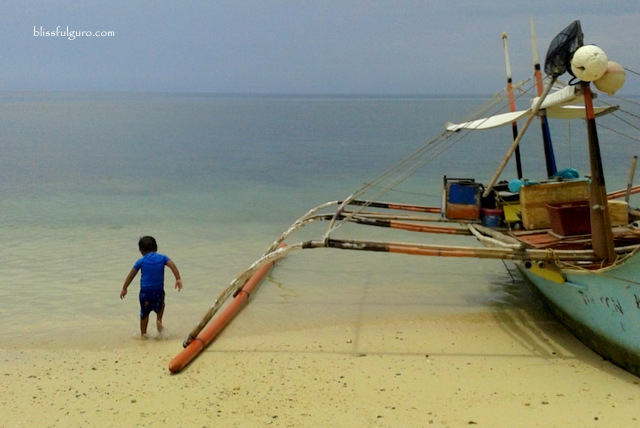 The warm breeze and the sound of the waves were soothing. This calls for a beer sesh, my buddy quirked. 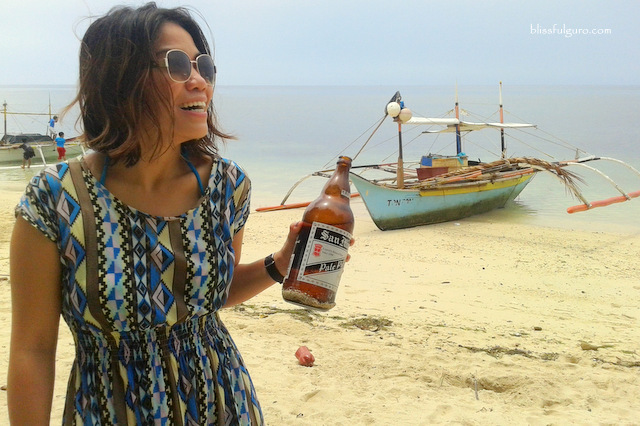 We had liters and liters of beer (P90) until we were boozed up. We took a nap, set the alarm just in time for sunset and cherished that woozy moment. We were laughing at ourselves when we noticed that the sunset we’re intending to watch was just about to end; blame it to oversleeping. We hurriedly went to the shore and watched as the sky turned gray. 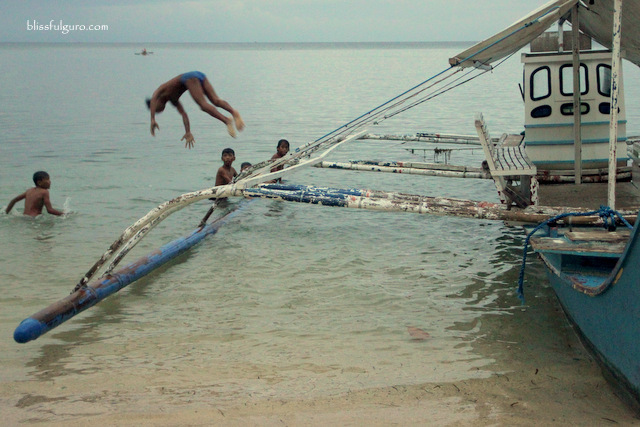 And then we noticed a group of young boys who seemed to be honing their skills in diving. Numerous stunts were performed right before us. I wanna clap and cheer but it might scare them away so I just enjoyed the scene while my buddy was busy taking snaps of what’s left from the sunset. 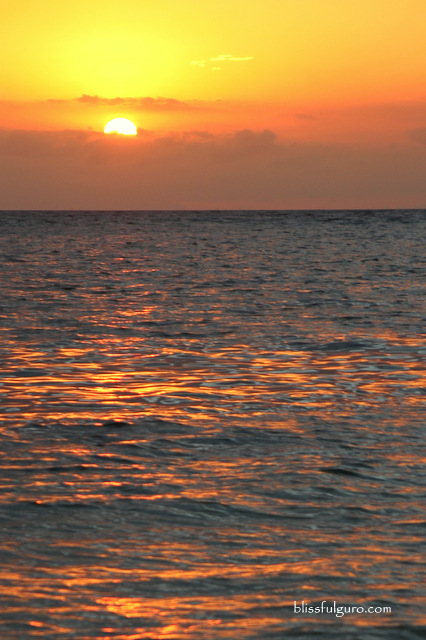 We honestly thought that we were along the coast of Gumasa Beach when we noticed how quiet the area was at dusk. It was weird. I was thinking that if it was indeed that famed beach then there would be more guests other than us. And then my buddy consulted his handy dandy smartphone and realized that we were on Sellona Beach, just beyond the rocks and karsts from Gumasa Beach. And then we laughed on our own mistakes. But we loved it, the serenity of the place together with those cute kids on their amazing playground. We had more booze that night and wound up on endless conversations on I dunno what that was. We woke with the sound of hissing voices on the sea. It was the group from yesterday. 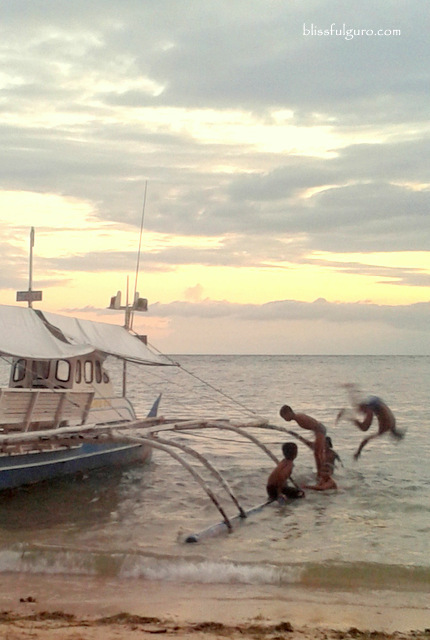 It was as if they didn’t go back home to sleep and just practiced their diving skills until dawn. We went to the beach, coffee on hand, and relished that moment. 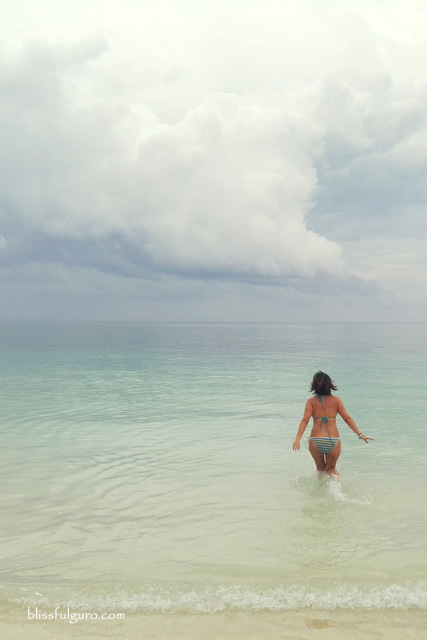 We dedicated that day on exploring the so-called Boracay of the South (and why do everyone compare every beach to that famed island again?!). 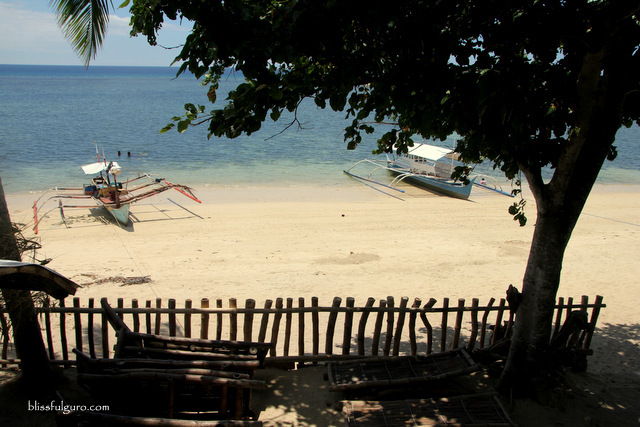 We took a 20-peso habal-habal ride to the ever famous beach resorts on Gumasa Beach just to take a peek on what this beach has to offer, but we were totally shooed away. 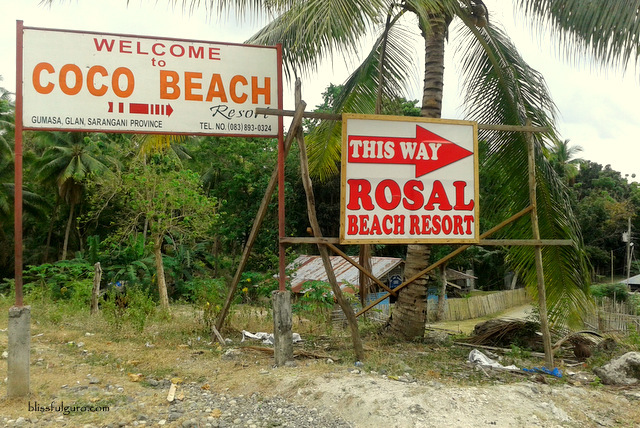 We thought that just by paying the entrance fee to these resorts (Coco Beach Resort, Rosal Beach Resort and White Haven Beach Resort) we could finally frolic under the sun, but no. 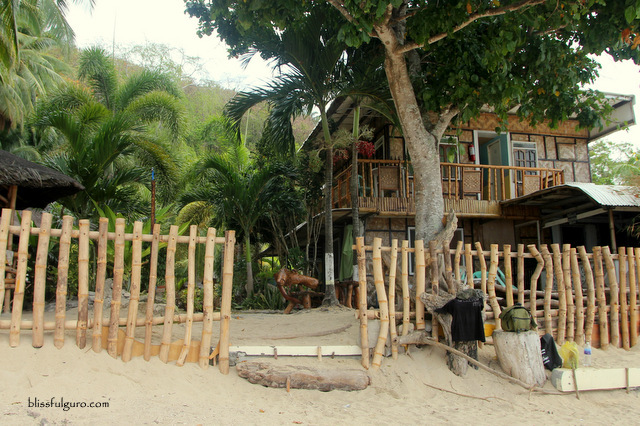 All of them expressed that we needed to rent a cottage (ranging from P400-P1,200) to get in. We tried to beg until we felt that it’s not worth it. We couldn’t pay that much for a cottage so we went back and looked for a public entrance to the beach which we couldn’t find on that side. Don't go to these resorts if you're planning to do a daytrip on Gumasa Beach. 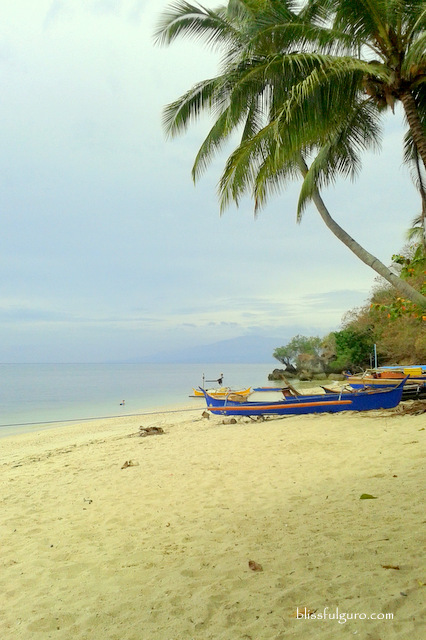 We hiked all the way back to the main road (which was around one kilometer) and planned to just settle on our resort’s Sellona Beach. The trike driver we had was so great that he pointed a public entrance right after Davak Ridge Resort. 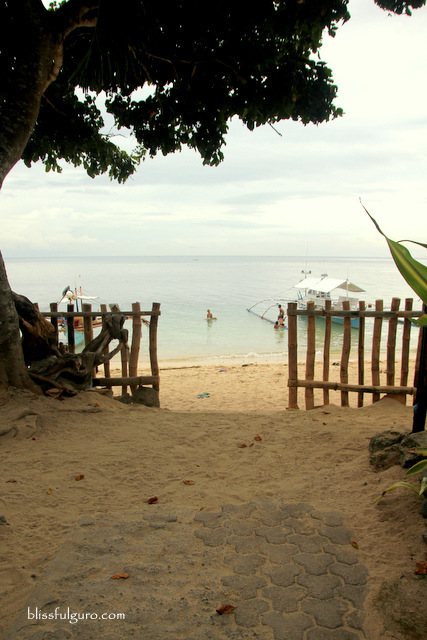 There were no guards manning the place and he just told us that we could just walk pass through the fenced gate and go to the beach, which we gladly did. And there we were, lying on the white sand of Taban Beach, which was twenty tumblings away from Gumasa Beach, enjoying the free beach all to ourselves. Right in front of the infamous resorts were a number of guests enjoying that part of the beach. But we’re okay here. We loved the seclusion. The area where we set up our stuff was rustic with a number of washed away logs and stuff. The sun was hiding. Too shy for us I think. I ran into the water and started to feel the warmness of it. 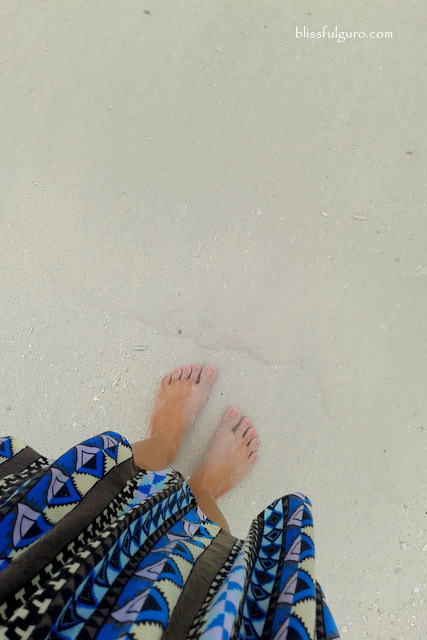 It was refreshing and soothing; the sand on your feet and the saltwater making its way to your skin. My buddy got us some booze, at ten in the morning, from those snobby resorts who shooed us away. Maybe they felt like they owned every little inch of sand on the beach. We guzzled some more and decided to go back to our home, in Sellona Beach. Going back to Sellona Beach was freedom. We needed not to argue with anyone just to get in the beach and stuff. 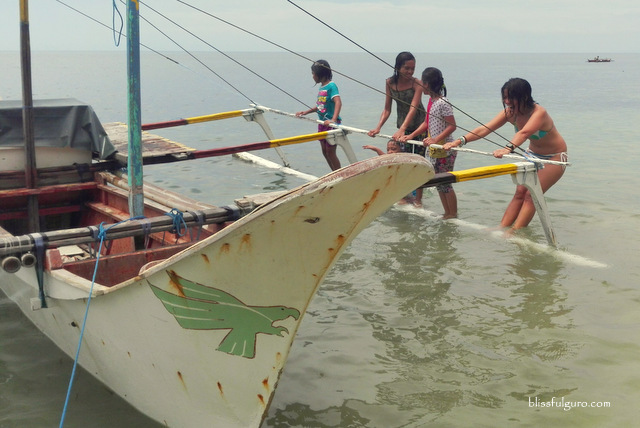 We’re with a bunch of kids that were still honing their diving skills making boats as their platforms. 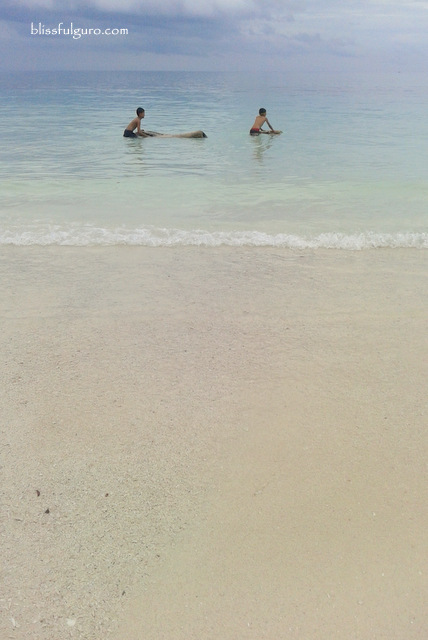 We basked in the sun, swam a bit and lazed until it’s time to go back to GenSan to catch our flight back to Manila. 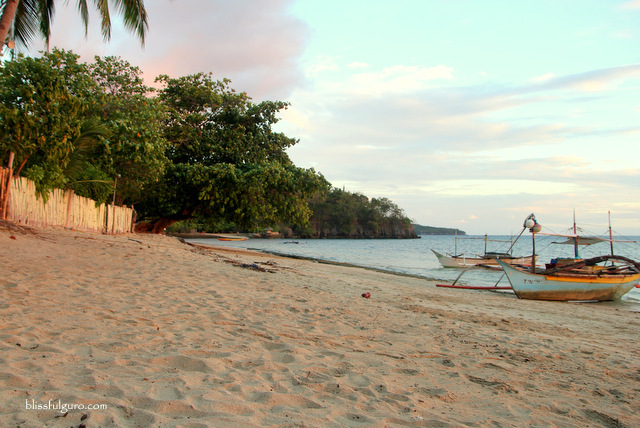 It was an accidental fate; thinking that our resort would be on Gumasa Beach. We stayed on Sellona Beach and felt more at ease with everything. Sellona Beach doesn’t have the whitest sand that Gumasa Beach claimed they have. But it’s the serenity and exclusion it has that I love. San Miguel is still the best beer in the world! super like! i would bookmark this post and include on my future considerations. 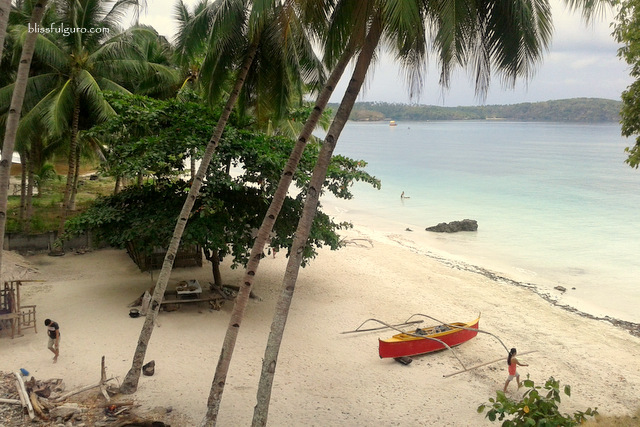 have had little beach experience in mindanao area. this post is definitely a big help in reconsidering exploring the beauty of the south. PS. I'm glad you liked that place. Hello there! 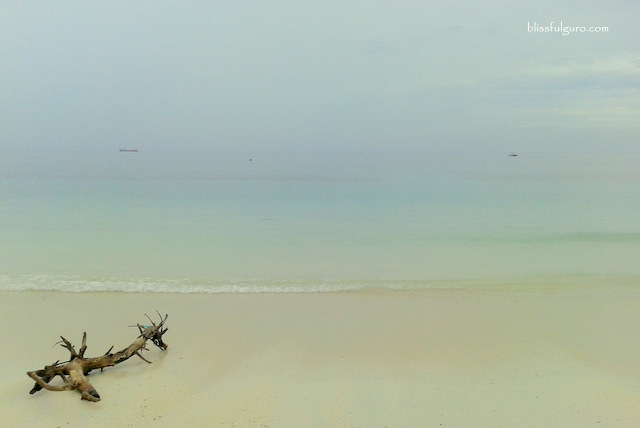 I love the beaches in Gumasa. We just had a hard time looking for a public entrance though. It's sad how the whole stretch of the beach is closed to the public.